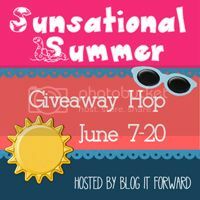 Lil' Blog and More: Blog Hop Sign up Opportunity for the Sunsational Summer Giveaway Hop! Blog Hop Sign up Opportunity for the Sunsational Summer Giveaway Hop! As you all know, I absolutely LOVE participating in Blog Giveaway Hops. I just learned of a new event, and had to share! If you are a Blogger, be sure to come join in! There will be a max of 150 bloggers participating, so be sure to sign up early. The event runs from June 7th, to June 20th. There is a $5.00 fee to join, unless you make a blog post. Then it's free :)! I'll be looking forward to this hop!